Lately we’ve been fortunate enough to receive release dates for new Xbox Live games a week or two in advance – including this week’s release, Monster Island. Naturally Windows Phone gamers are already anxious to know about next week’s new game, and we can now put those anxieties to rest. Microsoft Studios has officially announced that the Xbox Live version of Wordament launches on April 25. The game prematurely appeared on the Marketplace’s list of Xbox Live games last week, but was not Live-enabled. Wordament is already available as an indie game. The gameplay involves trying to find as many words as possible from a field of 16 letters, all within a time limit. The hook? You’re competing against hundreds of others in real-time over the internet. Visually it’s quite plain, but the multiplayer/leaderboard aspect is compelling. Head past the break for the full story and an update from the game's developer. In the past, owners of indie games that switched to Xbox Live status (such as Doodle God) had to repurchase the Xbox Live versions of those games if they wanted to experience the Live features like Achievements and new content. Wordament sidesteps the issue in two ways: first off, both the indie and Xbox Live versions are free, so money is not a factor. Second, on April 25, users who have downloaded the indie version will be prompted to download an update, changing their game to the Xbox Live build. This is actually unprecedented, but certainly the best way to make sure everyone transitions to the new setup. Wordament on Xbox Live will apparently have several new features over the previous version, with the team announcing a new one each day until the 25th. Today they reveal that separate language versions will be coming, starting with my second language of choice, Spanish on the 25th. Dutch, Swedish, French, German, and Italian versions will also emerge down the line. Each of these will first appear in (presumably public) BETA form to allow for proper multiplayer testing and fine tuning. No word yet on whether a US player will be able to get the Spanish Wordament, etcetera (See update below for the resolution to this particular question.). It’s a possibility with the betas, but highly unlikely with the final Xbox Live releases. There is currently no known way to download or purchase Windows Phone games from other regions using your existing GamerTag/account, unlike the Xbox 360 Marketplace. That explains why I still don’t have that European version of Who Wants to be a Millionaire? on Windows Phone, but managed to snag the unique European XBLA edition with its awesome South Park and Star Trek DLC. Finally, Microsoft will be promoting Wordament with an evening tournament and open house at their Bellevue, WA Microsoft Store. They promise food, giveaways, prizes, and human sacrifices, so a great time should be had by all. Okay, I’m kidding about the sacrifice part, but you never know for sure until you show up and see what happens. If anyone in Washington attends the party, remember to send some pics and tell us how it went. Wordament comes to Xbox Live worldwide on Wednesday, April 25. If you’d like to try out the indie game right now, grab it here from the Marketplace. First, we are shipping world-wide, for free, on April 25th and we support 7 user-interface languages: English, French, Italian, German, Spanish, Dutch, and Swedish. Wordament, like all Windows Phone apps, will automatically use the user interface language you've selected in Settings, if it's one of the 7 above, or revert to English for other languages. 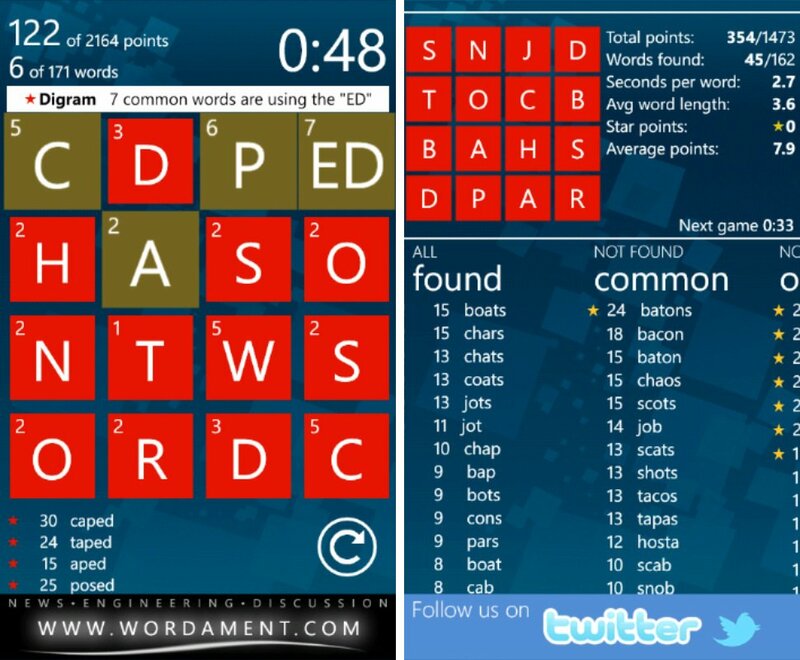 Because it's one app, we will have one set of Achievements for Wordament on Xbox LIVE on Windows Phone. If it's easiest for a player to earn their achievements in Spanish vs. English (for example), then they should play in the language that makes it the most fun for them.